The Peace Corps begins as a call to service. On March 1, 1961, President Kennedy signs an executive order establishing the Peace Corps. Three days later, Sargent Shriver is appointed its first Director. In July, Peace Corps assignments have been planned for Ghana, Tanzania, Colombia, the Philippines, Chile, and St. Lucia. More than 5,000 applicants take the first exams to enter the Peace Corps. On August 28, 1961, President Kennedy hosts a ceremony at the White House Rose Garden to honor the inaugural group of Volunteers, who will serve in Ghana and Tanzania. The 51 Americans who land in Accra, Ghana, make an immediate impression on their hosts: they form a chorus on the airport's tarmac in front of the minister of education and other officials and sing the Ghanaian national anthem in Twi, the local language. On September 22, 1961, Congress approves legislation formally authorizing Peace Corps, giving it the mandate to "promote world peace and friendship" through three goals: (1) To help the people of interested countries and areas in meeting their needs for trained workers; (2) To help promote a better understanding of Americans on the part of the peoples served; and (3) To help promote a better understanding of other peoples on the part of Americans. By the end of 1963, 7,000 Volunteers are in the field, serving in 44 countries from Afghanistan to Uruguay. More than half of the Volunteers work in education, one-fourth in community development and the remainder in agriculture, health care, and public works. In April 1964, the Peace Corps Partnership Project is established, a program that allows Americans here at home to support and contribute to Volunteer projects overseas. By June of 1966, more than 15,000 Volunteers are working in the field, the largest number in the Peace Corps' history. "We were the Peace Corps, the shiny new creation that President Kennedy had proposed in the last days of his 1960 campaign, his experiment in international development. Everyone, it seemed, was impressed. That summer, all across the country, our names were read on our local news stations on the days we departed for training. We were front-page stories in newspapers as diverse as the New York Times and the Kalamazoo Gazette. We were on the evening news with Walter Cronkite, and Huntley and Brinkley." "The spirit of the Peace Corps springs from the deepest wells in our culture, from the reasoned and strongly felt impulses of our people to share with their neighbors their caring and their labor." For the Peace Corps, the 1970s are a time of change, far-ranging ambition, and specialized talent. Despite budget constraints, by December of 1974, Volunteers are serving in sixty-nine countries, the largest number to date. The Peace Corps is working with developing nations as never before to plan and select projects to meet their specific needs. More foreign nationals join the Peace Corps as administrators; by 1973, they make up more than half of Peace Corps' overseas staff. Volunteers are more qualified than ever. Men and women with professional skills, such as doctors, engineers, and horticulturists, account for more than a fifth of the Volunteers. These Volunteers, Peace Corps officials believe, will have a significant "multiplier effect" -- they will transfer their talents to host country nationals who will in turn share them with their fellow citizens. As the Peace Corps becomes older, so do its Volunteers. The average age of a Volunteer reaches 27, and five percent of Volunteers are over 50 years old. In July 1971, the Nixon Administration folds the Peace Corps and several other federal volunteer programs into a new federal volunteer agency called ACTION. In 1979, President Jimmy Carter signs an Executive Order that grants the Peace Corps full autonomy. At the close of the decade, more than 6,000 Volunteers are at work in the field and two returned Volunteers have been elected to the United States Senate: Paul Tsongas of Massachusetts, who served in Ethiopia from 1962-64, and Christopher Dodd of Connecticut, who was a Volunteer in the Dominican Republic from 1966-68. "The kids I taught were always with me, and I loved them even more than I once loved my privacy. I always wanted to have children, but I never thought I'd have so many and so soon." "Each one of us is responsible for building the society we want. Peace Corps volunteers do that with people-to-people exchanges, using their energy, their spirit, and their creativity to solve problems.This is the American way. Once we see a need, we want to serve -- even when the neighbor we reach out to help is halfway around the world." For the Peace Corps, the 1980s prove to be a time both to reflect and to move forward. Reflection takes the form of celebrations, donations and a parade: In 1981, Congress passes legislation that makes the Peace Corps an independent federal agency. On June 2, 1981, a celebration to honor the Peace Corps' 20th anniversary is held in Washington, D.C. To date, nearly 98,000 Volunteers have served in 88 countries. On September 19-20, 1986, Peace Corps celebrates its 25th anniversary. Five thousand returned Volunteers gather at the Washington Mall in the nation's capital to take part in the celebration. On November 20, 1986, the John F. Kennedy Library hosts a special Peace Corps remembrance of President Kennedy, 25 years after his death. Peace Corps archives, including Volunteer journals and other artifacts, are donated to the library. And on January 20, 1989, a group of returned Volunteers, carrying the flags of more than 60 nations where Volunteers have served, march in the presidential inaugural parade. Far from being nostalgic about the past, however, Peace Corps staff and Volunteers push ahead with the same dedication to improving people's lives, including a new emphasis on small-business development. In 1982, Loret Miller Ruppe, who will serve longer than any other Peace Corps director, launches a program called Competitive Enterprise Development to promote business-oriented projects. In addition, Peace Corps establishes several other new programs -- the Caribbean Basin Initiative, the Initiative for Central America and the African Food Systems Initiative -- to help the nations in these areas of the world solve problems particular to their regions. In 1982, the number of Volunteers falls to 5,380 -- the lowest number since 1962 -- but by 1985, funding has increased and by 1986, the number of Volunteers reaches 6,264. In 1985, Congress establishes a goal of having 10,000 Peace Corps Volunteers serving in the field by the year by 1992. On January 30, 1985, the first Peace Corps Fellows Program is established at Teachers College/Columbia University to recruit, prepare and place returned Volunteers as teachers in the New York City public schools. The Fellows Program soon expands to include teachers of different subjects such as English as a Second Language as well as people interested in disciplines such as Business Administration, Nursing, Public Health, and Urban and Regional Planning. On September 28, 1989, Director Paul Coverdell announces the establishment of "World Wise Schools," a new program that enables students in America's schools to correspond with Volunteers serving overseas in an effort to promote international awareness and cross-cultural understanding. By the late fall of 1989, more than 550 schools are participating in the program. "The rush of pride and sense of awareness I shared with the people I worked with comes back to me at different times during my life today. I think of it when I need a reminder of how human beings everywhere contribute each day to the well-being of our world. This happens whether we are recognized for it or not. This lesson is one of the many gifts given to me while I was a Peace Corps Volunteer." "The Peace Corps is a remarkable tradition that emphasizes that our country is about more than power and wealth. It is also about the power of our values and the power of a helping hand, the ethic of service, and the understanding that we have an obligation not only to our own people, to people around the world to help them make the most of their own lives." For the Peace Corps, the 1990s are a decade of firsts. On June 15, 1990, President George Bush praises the first Volunteers to serve in Eastern Europe during a Rose Garden ceremony before they depart for Hungary and Poland. On July 22, 1992, the first group of Volunteers to serve in the former Soviet Union leaves to work in small business enterprise projects in Estonia, Latvia. and Lithuania. In October 1993, Carol Bellamy becomes the first returned Volunteer to be confirmed by the Senate as Director of the Peace Corps. On June 12, 1993, the first group of Volunteers to work in China leaves to serve as English teachers. In August 1995, Mark Gearan is confirmed by the Senate as the 14th Director of the Peace Corps. He launches the Crisis Corps, a new program that allows returned Volunteers to provide short-term assistance during natural disasters and humanitarian crises. By 1998, Crisis Corps Volunteers are serving in Guinea, Bolivia, Paraguay, Papua New Guinea, and other countries. On April 30, 1996, the Peace Corps hosts the first Conference on International Volunteerism. Vice President Al Gore opens the conference with an address to the leaders of 36 volunteer organizations from 26 countries at the Georgetown University School of Foreign Service. The decade also sees the return of the first "firsts": on June 19, 1996, President Clinton honors the first group of Volunteers ever to serve in the Peace Corps. In a reunion in the Rose Garden, the Peace Corps' trailblazers, who served in Ghana 35 years before, meet a new group about to leave for the same country. In September 1996, the Loret Miller Ruppe Memorial Lecture Series is established. The series serves as a forum for distinguished individuals to speak about issues related to the Peace Corps' mission, such as volunteerism, international peace and development, and public service. Former Peace Corps Country Director and U.S. Ambassador Richard Holbrooke delivers the first lecture. John Hume, a pivotal figure in the Northern Ireland peace process, delivers the second lecture on St. Patrick's Day 1998. On February 13, 1997, 31 Peace Corps Volunteers leave the U.S. to become the first group ever to serve in South Africa. On April 30, 1997, the first group of Volunteers to serve in Jordan begin in small business development and ecotourism, primarily with women. By the end of 1998, the first Volunteers begin serving in new Peace Corps programs in Bangladesh and Mozambique. On March 18, 1998, the six returned Peace Corps Volunteers who serve in Congress, Secretary of Health and Human Services and returned Volunteer Donna Shalala, and former Peace Corps Director Paul Coverdell testify before the House Committee on International Relations in support of President Clinton's initiative to expand the Peace Corps to 10,000 Volunteers by the year 2000. With the new millennium approaching, the Peace Corps moves into its own headquarters building on 20th Street in Washington, D.C. First Lady Hillary Rodham Clinton, Queen Noor Al-Hussein of Jordan, members of the President's cabinet, Members of Congress, dignitaries, returned Volunteers, and many friends of the Peace Corps join together on September 15, 1998, to dedicate the Peace Corps' home for the 21st century. "My parents, who had served as Volunteers in Kenya 25 years before I joined the Peace Corps, had absolutely no idea how much influence they had during their two years of service. They did not consider themselves exceptional Volunteers; they simply went to class, taught a variety of subjects in the best way they knew how, and loved the people they lived among. But returning with me to their village so many years later, they were struck by the undeniable realization that they had indeed changed people's lives." Presidential Candidate John F. Kennedy addresses the students at the University of Michigan in a 2a.m. impromptu speech challenging them to give two years of their lives to help people in countries of the developing world. Inspired by the speech, students form "Americans Committed to World Responsibility" and organize a petition drive asking for the establishment of such a program; within weeks, more than 1,000 Michigan students have signed it. President Kennedy includes what becomes basic Peace Corps philosophy in his inaugural address: "To those people in the huts and villages of half the globe struggling to break the bonds of mass misery, we pledge our best efforts to help them help themselves..."
President Kennedy issues Executive Order creating the Peace Corps. Three days later, Sargent Shriver is appointed its first director. 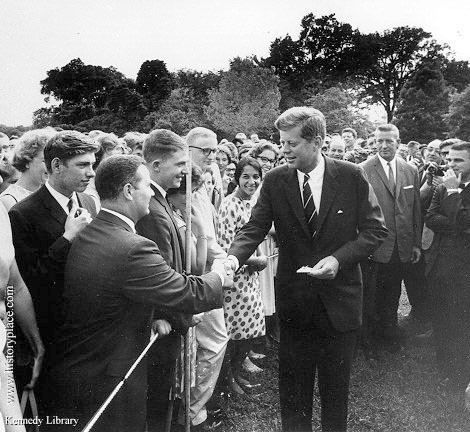 President Kennedy hosts ceremony at the White House Rose Garden in honor of the first group of Peace Corps volunteers departing for service in Ghana and Tanganyika (later Tanzania). Congress approves legislation formally authorizing the Peace Corps, giving it the mandate to "promote world peace and friendship" through the following objectives: (1) To help the people of interested countries and areas in meeting their needs for trained manpower; (2) To help promote a better understanding of Americans on the part of the peoples served; and (3) To help promote a better understanding of other peoples on the part of Americans. By the end of the year, Peace Corps programs start up in Brazil, Chile, Colombia, Ghana, India, Malaysia, Nigeria, Pakistan, Philippines, St. Lucia, Sierra Leone, Tanzania and Thailand. Total number of volunteers reaches 750. Programs begin in Afghanistan, Belize, Bolivia, Cameroon, Cyprus, Dominican Republic, Ecuador, El Salvador, Ethiopia, Iran, Ivory Coast, Jamaica, Liberia, Nepal, Niger, Peru, Somali Republic, Sri Lanka, Togo, Tunisia, Turkey and Venezuela. As of June 30, 1962, 2,816 volunteers are in the field. Programs begin in Costa Rica, Gabon, Grenada, Guatemala, Guinea, Honduras, Indonesia, Malawi, Morocco, Panama, Senegal, and Uruguay. As of June 30, 1963 there are 6,646 volunteers in the field. Peace Corps Partnership Program is started to provide a link between U.S. contributors and requests for project assistance from the overseas communities in which Peace Corps volunteers serve. .
More than 15,000 volunteers are serving in the field, the largest number in Peace Corps history.. The first Peace Corps volunteers are elected to U.S. Congress. Paul Tsongas of Massachusetts -- a volunteer in Ethiopia from 1962 to 1964 -- and Christopher Dodd of Connecticut -- a volunteer from the Dominican Republic from 1966 to 1968. Tsongas is elected to the U.S. Senate in 1978, Dodd in 1980. Peace Corps programs are operating in 69 countries, the largest number to date. President Reagan offers congratulations to the Peace Corps on 20th anniversary of Kennedy's executive order. 20th anniversary of returned volunteers held in Washington, D.C. Peace Corps has had programs in 88 countries; 97,201 Americans have become Peace Corps volunteers and/or trainees. The first Peace Corps Fellow Program is established at Teachers College/Columbia University to recruit, prepare and place RPCVs as teachers in the New York City public schools. In exchange for a two year work commitment, the RPCVs are offered scholarships for graduate study. Nearly 5,000 returned Peace Corps volunteers gather at the Washington Mall to celebrate the Peace Corps' 25th anniversary. The John F. Kennedy library hosts a special Peace Corps remembrance of President Kennedy, 25 years after his death. At the event, Peace Corps archives, including voluminous volunteer journals and other artifacts, are formally donated to the Library. Carrying the flags of more than 60 nations where Peace Corps volunteers serve, a group of former volunteers and staff march for the first time in a presidential inaugural parade. President Bush announces from Budapest that Peace Corps volunteers will go to Hungary, establishing the first Peace Corps program in an Eastern European country. Director Paul Coverdell announces Peace Corps' "World Wise Schools" initiative. This program matches Peace Corps volunteers overseas with elementary and junior high classes in the U.S. in an effort to promote international awareness and cross-cultural understanding. By the late fall of 1989 more than 550 schools are participating in this unique educational program. In a Rose Garden ceremony, President Bush praises "the group of talented Americans who are...to take leave of these shores -- and become the first Peace Corps volunteers to serve in Eastern Europe." The 121 volunteers met with the President during their stop over in Washington, D.C. en route to Poland and Hungary. Peace Corps celebrates its 30th anniversary. More than 125,000 Americans have served in more than 100 countries. The first group of Peace Corps volunteers leaves for the former Soviet Union. These volunteers will work in small business enterprise projects in Lithuania, Estonia, and Latvia. The first group of English teacher volunteers leaves for China. The Peace Corps Partnership program celebrates its 30th anniversary. Over the course of its 30 years, Peace Corps Partnership Program has supported nearly 3,500 projects in more than 80 developing countries. Director Mark Gearan sends Peace Corps volunteers to the island of Antigua to help rebuild homes damages or destroyed by Hurricane Luis. This pilot effort marks the first assignment of the "Crisis Corps," a new program within the agency that enables experienced Peace Corps volunteers to respond to humanitarian crises and natural disasters. Peace Corps celebrates its 35th anniversary in Washington, D.C., where more than 1,500 returned Peace Corps volunteers attend a series of events to honor their service. Nearly 7,000 volunteers are currently serving in 94 developing countries. Peace Corps sends a small contingency of volunteers to Haiti, marking the Peace Corps' return there after a five year absence. Peace Corps concludes a two-day conference on international volunteerism in Washington, D.C., where representatives from 36 volunteer organizations representing 26 countries plan joint ventures and discuss the future of volunteerism. President Clinton honors the Peace Corps at a Rose Garden ceremony reuniting the first group of volunteers who left for Ghana 35 years earlier, and a new group just about to leave for Ghana. The first-ever comprehensive survey of returned Peace Corps volunteers is released, showing that 94 percent of those who volunteered would make the same decision to join. Seventy-eight percent of returned volunteers are involved in community service once they return home, resulting in a significant "domestic dividend." In one of the U.S.'s most tangible gestures of partnership with South Africa, 31 Peace Corps volunteers depart to work with South African teachers, after a rousing farewell at Howard University featuring the Reverend Jesse Jackson. The first group of volunteers depart for Jordan to work on small business development and eco-tourism, primarily with women. First Lady Hillary Rodham Clinton, in hosting the send-off, also announced the creation of the Loret Miller Ruppe Fund for the Advancement of Women, named for the longest serving Peace Corps director and a champion of women in development. Twenty-two of the 29 Jordan volunteers are women. The Peace Corps hosts a reception and book reading at the Embassy of Ghana in Washington to commemorate its new publication, a collection of short stories called Peace Corps: The Great Adventure. The book chronicles personal memories and anecdotes of Peace Corps volunteers and friends of the Peace Corps spanning 36 years. In his first radio address of 1998, President Clinton proposes expanding the Peace Corps to 10,000 volunteers serving overseas by the year 2000, a 50 per cent increase in the number of volunteers. The proposal is the largest funding increase requested for the Peace Corps since the 1960s. The first annual Peace Corps Day is recognized to commemorate the agency's 37th anniversary and to highlight the "domestic dividend" of returned Peace Corps volunteers, particularly in schools. More than 5,000 returned volunteers give presentations in classrooms in all 50 states. On what would have been President John F. Kennedy's 81st birthday, Peace Corps Director Mark Gearan proclaims today "Senior Volunteer Appreciation Day" to recognize the talent and energy that older Americans bring to Peace Corps service. As a part of that day, the Peace Corps hosts a forum on senior citizens and their Peace Corps service. Participants include James E. "Chip" Carter, III, grandson of Miss Lillian Carter, one of the best known senior Peace Corps volunteers. First Lady Hillary Rodham Clinton and Her Majesty Queen Noor of Jordan help the Peace Corps lay a new foundation for the 21st century by dedicating the new Peace Corps building in the nation's capital and launching the agency's new campaign to recruit volunteers who will be serving overseas in the new millennium. Others celebrating at Peace Corps headquarters include Secretary of Health and Human Services Donna Shalala, Senator Christopher Dodd of Connecticut, Senator Paul Coverdell of Georgia, the first Peace Corps Director Sargent Shriver, and several members of the U.S. House of Representatives. Paving the way for expanding the number of Peace Corps volunteers to 10,000 serving overseas by the year 2003, President Clinton signs legislation authorizing a 50 percent increase in the Peace Corps budget. The initiative, introduced in the U.S. Senate by Senators Coverdell and Dodd, increases the Peace Corps budget from $241 million to $365 million by 2003. Director Mark Schneider announces that, for the first time ever, all 2,400 Peace Corps volunteers serving in 25 countries in Africa will be trained as educators of HIV/AIDS prevention and care. Schneider also announces a $500,000 grant from the Bill & Melinda Gates Foundation to prepare better educational materials, conduct extensive training, and promote broad-based community outreach efforts. In addition, 200 volunteers will be deployed to work on HIV/AIDS assignments through the Crisis Corps. The Peace Corps kicks off 40th anniversary events at the University of Michigan, Ann Arbor. Director Schneider and Michigan-area RPCVs visit the university to commemorate President Kennedy's historic speech on the steps of the student union during a late-night campaign stop in 1960. The Peace Corps receives its largest budget in history when President Clinton signs the foreign assistance funding bill. The new $265 million budget is an increase of $21 million over the previous year, and reflects strong bipartisan support in Congress for the Peace Corps. The volunteer corps reaches the highest level in 26 years. With more than 7,300 volunteers and trainees serving in 76 countries around the world, the Peace Corps gets closer to its goal of fielding 10,000 volunteers. This historic level comes at a time when the Peace Corps also has the most diverse body of volunteers in recent memory. The Peace Corps plans to re-open the program in Uganda, where 20 volunteers will work in education and community mobilization. The agency also plans to establish a new program in the Republic of Georgia, where the first 25 volunteers will teach English. The new program in Georgia marks yet another step by the Peace Corps to expand opportunities for Volunteers to serve in countries of the former Soviet Union. I had an English teacher between 1972 and 1973 in Mampong Ashanti, in Ghana West Africa, at St. Monica's Secondary School. Her only name I remember is Miss Daunt and she taught us lovely songs and treated us so well. I wish I could get connected to her. Is it possible through here? I would be really grateful if I can be connected to her. Thank you so much.